Gurunanak College of Pharmacy 1, Kamgar Nagar, Nagpur - 440026, Maharashtra, India. Dr. Ambedkar College 2, Deeksha Bhoomi, Nagpur - 440010, Maharashtra, India. 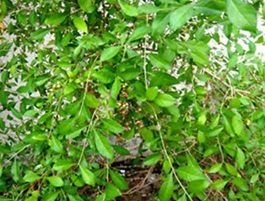 ABSTRACT: Henna (Lawsonia inermis) is widely used cosmetically and medicinally. Literature survey reveals that the plant henna also has anticancer activity. Most of the anticancer activities of Lawsonia inermis plant are carried out using total leaves extract, and purified individual compounds also. The cytotoxicity profile of the extracts, as well as purified fractions, was determined by MTT assay on HeLa cell line. As the total ethanolic extract demonstrated growth inhibition in cancer cells, attempts were made to isolate the active compound from total ethanolic extract, with potent activity. Lawsone, 2-hydroxy-1, 4-naphthoquinone is the active constituent of Lawsonia inermis (Henna), L. alba, and other species of Lythraceae family. It is reported to posses various medicinal properties. The present study reports the anticancer activity of lawsone, naphthoquinone derivative isolated from the henna leaves, and its predictive conformation by spectral studies. Isolated lawsone was tested for the anticancer activity, which showed significant results. INTRODUCTION: The associated intolerable side effects of the radiation and some chemotherapeutic agents take away the “Quality of Life,” of a cancer patient, though they provide effective control over cancer. Some of them are effective and agents of choices by the oncologist. However, the pain and agony through which the cancer patient goes due to side effects are unexplainable. Hence, the other side of cancer is compiling to take a look and give thought process to alternate medicine. Given ancient claims about the utility of plant material on understanding the molecular mechanism of cell multiplication and testing chemical entities for the targeted interruption in the cell proliferation in cancer, modern research indeed revealed some effective phytochemicals for the cancer therapy 1, 2. A single plant cell is a huge chemical reactor, that way a plant is a huge chemical factory. And if the chemical structures of latest anticancer drugs are studied their identical or prototypes are already available in plants. Hence, it is not unreasonable to believe that a potent anticancer drug can be isolated from the plant. Interest has reviewed recently, in henna to investigate isolation, purification, and identification of novel anticancer active phytochemicals that might lead to drug development for intolerable and incurable cancer disease. These plant-derived drugs are considered natural, safe, beneficial and affordable 2. Henna is considered a safe herbal medicine with only a few and insignificant side effects 16, 17. Lawsonia Inermis Linn. (Henna): Lawsonia inermis L., (Henna) belongs to family Lythraceae is an ornamental flowering plant found abundant in Iran, Sudan, Somalia, Egypt, Morocco, Yemen, Niger, India and Pakistan 3. This plant is multi-branched, deciduous shrub or small tree having 2.6 m height. Leaves of this plant are 1.3-3.2 cm broadly or elliptic-lanceolate and bear grey-white color flowers 4. Flowers are used as a fragrant agent in local scent. Seeds are deodorant and yield oil, while flowers are refrigerant and soporific and yield a fragrant oil 5. All parts of this plant are reported to have some medicinal use. Leaves contain a dyeing pigment lawsone (2-hydroxy-1,4-naphthoquinone), which is widely used in cosmetic and textile industry 6. Henna is a well-known plant for centuries. Throughout the world, it is used medicinally and cosmetically. Since, ancient culture, this plant is used in wedding, especially to grace / embellish bride, in Eids and social celebrations. Henna is applied to dye palms, hands, forearms, fingernails, hairs, legs, soles or feet, and other body parts. All over the world henna body art is very much popularised, in the form of tattoos, designed on arms, legs, behind the neck. This stain last for 3-4 weeks 7. The plant is reported to contain carbohydrates, proteins, flavonoids, tannins and phenolic compounds, alkaloids, terpenoids, quinones, coumarins, xanthones and fatty acids 8. The plant has a wide range of phytochemicals including lawsone, isoplumbagin, lawsoniaside, lalioside, lawsoniaside B, syringinoside, daphneside, daphnorin, agrimonolide 6-O-β-D-glucopyranoside, (+)-syringaresinol O-β-D-glucopyranoside, (+)-pinoresinol di-O-β-D-glucopyranoside, syringa-resinol di-O-β-D-glucopyranoside, isoscutellarin3β, hennadiol, (20S)-3β, 30-dihydroxylupane, lawnermis acid, 3-methyl-nonacosane-1-ol, laxanthones I, II, III and lacoumarin 9, 10, 11. Various in-vitro and in-vivo biological studies of L. inermis have reported the plant to have analgesic, hypoglycemic, anti-malarial, hepatoprotective, nootropic, immuno-stimulant, anti-inflammatory, antibacterial, antimicrobial, antifungal, antiviral, anti-parasitic, antitrypanosomal, antidermatophytic, anti-oxidant, anthelmintic, antifertility, tuberculostatic and anticancer properties 12, 13, 14, 15. The Scientific Committees on Consumer Products and Consumer Safety has presented a summary of detailed toxicity studies done on henna 16, 17. In some cases, the henna extract was found to induce allergic reactions such as itching, depigmented skin patches, blistering and permanent scarring also, which are treated with antibiotics and corticosteroids 18-22. The use of para-phenylenediamine (PPD) in henna for getting a long-lasting stain, is the main cause of allergic contact dermatitis or serious allergic reactions 23-29. Plant Material: The leaves of Lawsonia inermis were collected from the local area of Nagpur region. The leaves were washed with water to remove the dust and were shade-dried. The leaves of Lawsonia inermis were authenticated from the Botany Department of Rashtrasant Tukdoji Maharaj, Nagpur University, Nagpur allotted with the specimen number 10014. The cancer cell lines were procured from National Centre for Cell Science, Pune and pure lawsone was procured from Himedia, India. Preparation of Extract (Extraction of Plant Material): Two extracts were prepared, one alcoholic and the other hydroalcoholic (1:1). The extraction was carried out by the cold maceration process. Ethanol was added to the shade dried leaves of Lawsonia inermis, mixed properly and was kept for maceration for 15 days with occasional shaking. After completion of extraction with ethanol, the leaves were air dried, and the same leaves were extracted with the mixture of ethanol and water (1:1), by cold maceration for 15 days. In both the cases solvent was removed by evaporation, the residue obtained was dried, weighed and percentage yield was determined. This was followed by defatting of the total ethanolic extract by n-hexane. All these three extracts, i.e. alcoholic, hydroalcoholic and the defeated fraction where tested for anticancer activity. Anticancer Activity (MTT ASSAY): The cytotoxicity of the alcoholic extract on in-vitro cultured HeLa cell (the human cervical cancer cells) was determined. Freshly passaged HeLa cells were centrifuged and washed with MEM. The cell count was adjusted to 2.5 × 105 cells/ml by suspending the cells in fresh RPMI with 5% FBS (Invitrogen). This cell suspension was then transferred to a 96- well TC plate for the assay. A gradient of extract concentrations was supplemented in the medium for the assay and had the final concentration 500, 1000, 1500 and 2000 μg/mL. The plate was incubated at 37◦C in a humidified environment with 5% CO2 in air for 48 h. After incubation, the cells were washed and re-suspended in fresh medium containing MTT (Himedia) and were further incubated for 3 h. The MTT formazan formed in the viable cells was extracted in DMSO (BIOGENE Reagents Inc., CA, USA) and read at 570 nm in the Bio-Rad ELISA plate reader. All the three extracts were subjected to MTT assay. DNA Fragmentation Analysis: DNA fragmentation is the biochemical hallmark of apoptosis. Jurkat, Molt-4 cells and human lymphocytes were exposed to nisin at the cytotoxic concentration, and the cells were incubated at 37 ºC for 6 h as well as for 48 h. The degree of DNA fragmentation was determined by performing electrophoresis, as per the protocol detailed by Barry et al., 30 the treated and untreated cells were directly subjected to agarose gel electrophoresis. The cells were loaded into the wells cast in the cell lysis gel- 0.9% agarose in TBE buffer pH 8.0 with 2% SDS and 64 µg/mL proteinase K (SIGMA). The cell lysis gel was followed by the 2% agarose separating gel. The electrophoresis was carried out in TBE buffer pH 8.0 overnight at 35V. Single Cell Gel Electrophoresis (SCGE) / Comet Assay: To further assess apoptosis and DNA fragmentation, a more specific and sensitive comet assay was performed 31, 32, 33. The Jurkat, Molt-4 cells and human lymphocytes were treated with 600 µM concentration of nisin in RPMI without serum for 3 h at 37 ºC. Cells exposed to 60 µM H2O2 34 were treated as a positive control and untreated cells as negative control. After incubation, the cells were embedded in 1% low melting agarose in PBS and were lysed in lysis buffer at 4 ºC for 2 h. The lysed cells were then incubated in 0.3N NaOH, 1mM EDTA solution for 30 min at room temperature and further electrophoresed at 25V for 20 min in the same buffer. 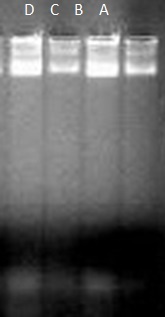 After electrophoresis, the agarose-embedded cells were stained with propidium iodide (20 µg/mL) in PBS washed with chilled distilled water and observed under Motic Fluorescent microscope. Isolation of the Lawsone: The lawsone isolation was carried out as per the procedure is given in the book Practical Pharmacognosy by Dr. C. K. Kokate. About 50 g of crushed fresh henna leaves were agitated for 2 h with 20% sodium bicarbonate solution. The extract was filtered, and the marc was re-extracted for 1h with the same solution, filtered and the alkaline extracts were combined. The extract was acidified with dilute sulphuric acid and was re-extracted with sufficient quantity of ammonium hydroxide, followed by dilute hydrochloric acid to acidify it. The product was finally extracted with benzene and yielded yellowish-brown colored crystals of lawsone. The yield of lawsone was found to be 1.5% w/w. This isolated pure lawsone was tested for anticancer activity using above said MTT Assay on the HeLa cell line, which showed prominent activity. RESULTS AND DISCUSSION: The prominent color and maximum yield of lawsone could be used as a hallmark compound in Lawsonia inermis L. Comparison of the isolated compound, and standard lawsone was carried out using Co-TLC plate, in which Rf value of both were the same, i.e. 0.66. The melting point of isolated lawsone was carried out, which was found to be same as that of standard lawsone i.e.195-196 ºC. Isolated compound was confirmed by using spectral studies. The UV spectra of the isolated compound and standard lawsone was found to be same with 1.78 λmax. Also the, IR results were found to be similar to each other. Thus, from the above analytical results, there is no doubt to reason that the isolated compound was lawsone, an active naphthoquinone derivate. FIG. 3: THE ABOVE IR SPECTRA CONFIRMS THE FUNCTIONAL GROUP OF ISOLATED LAWSONIA INERMIS L.
To further confirm the results of electrophoresis Fig. 8, comet assay was performed using same cytotoxic concentration of isolated lawsone derivative versus pure lawsone to treat the cells and as was used for agarose gel electrophoresis. 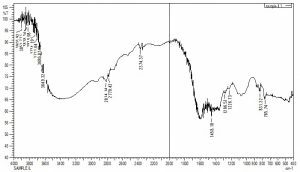 But even much higher concentration purified lawsone derivative exposure failed to induce actual comets with substantial tail length, as were induced by 60 µM H2O2 Fig. 7C. All the comets were graded as per Choucroun et al., 35 and a count of C>1 was determined to derive a percentage of cells with DNA damage from a total of 50 randomly scored cells. There was no significant difference in the percentage of C>1 cell in the batch of lawsone treated and untreated cells. From the above data, it can be confirmed that the plant has anticancer activity. 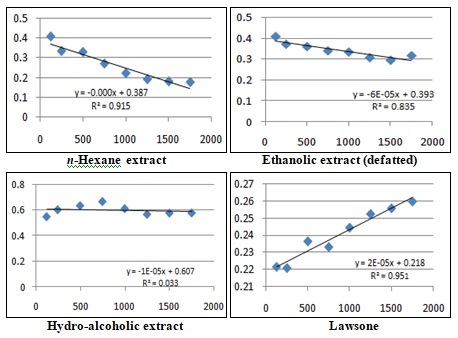 The above graph shows that both henna alcoholic extract and isolated lawsone displayed the cytotoxic effects against HeLa cell line. FIG. 6: GIEMSA STAINING FOR CELL MORPHOLOGICAL ANALYSIS. The cells treated with a cytotoxic concentration of purified lawsone derivative demonstrated typical apoptotic cellular morphological changes when pictured at different incubation time intervals. FIG. 8: SINGLE CELL GEL ELECTROPHORESIS (SCGE) / COMET ASSAY. Comet assay results revealed that the purified lawsone derivative (A) was more potent in inducing DNA fragmentation in HeLa cells compared to pure lawsone (B). However, the extent of DNA fragmentation induced by purified lawsone derivative could not induce very drastic DNA fragmentation as was shown by 60 µM H2O2 (C) which served as positive control. FIG. 7: DNA FRAGMENTATION ANALYSIS. Agarose gel electrophoresis of cells subjected to standard lawsone (A), purified lawsone derivative (B), untreated control (C), and positive control 60 µM H2O2 (D) are depicted in this figure. Purified lawsone derivative and positive control gave the same pattern of DNA fragmentation while standard lawsone and untreated control cells showed similar DNA pattern on 1% agarose gels. CONCLUSION: In view to discovering an effective, potent and economic anticancer drug from the herbal origin with no or fewer side effects, the literature search for local plants having alleged anticancer activity ended on one of the potential plants namely Lawsonia inner. MTT assay performed on various extracts using HeLa and IMR-32 cell lines showed prominent anticancer activity with alcoholic extract. Lawsone, a naphthoquinone derivative with prominent color and maximum yield has proved to have anticancer activity, which is further proved by DNA fragmentation. The spectral studies and Co-TLC of the isolated compound showed similar results as that of the lawsone. Farnsworth NR, Akerele O, Bingel AS, Soejarto DD and Guo Z: Medicinal plants in therapy. Bulletin of the World Health Organization 1985; 63(6): 965-98. Cragg G, Newman D and Snader K: Natural products in drug discovery and development. Journal of Natural Products 1997; 60(1): 62-60. Semwal BR, Semwal D, Combrinck S, Cartwright-Jones C and Viljoen A: inermis Linn. (Henna): Ethnobotanical, phytochemical and pharmacological aspects. 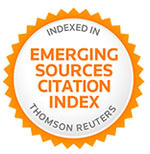 Journal of Ethnopharmacology 2014; 155(1): 80-103. Sastri BN: The Wealth of India: Raw Materials. CSIR, New Delhi, Edition 6th, Vol. (L-M), 1962: 47-50. Nadkarni KM: Indian Materia Medica, Popular Prakashan, Mumbai, Edition 3rd, Vol. I, 2000: 730-731. Chopra RN, Nayar SL, Chopra IC, Asolkar LV, Kakkar KK, Chakre OJ and Varma BS: Glossary of Indian medicinal plants. Council of Scientific & Industrial Research, New Delhi, First Edition 1956. Bhuiyan RM, Ali A, Islam A, Hannan MA, Kabir SM and Islam MN: Colouration of polyester fiber with natural dye Heena (Lawsonia inermis ) without using mordant: A new approach towards a cleaner production. Fashion and Textiles 2018; 5: 2. Rao NB, Kumari SO and Gajula RG: Phytochemical analysis and antimicrobial activity of inermis (Henna). Journal of Plant Science and Research 2016; 3(2): 158. Rastogi RP and Mehrotra BN: Compendium of Indian Medicinal Plants, Publications and information Directorate, New Delhi, First Edition 1991: 409-410. Rastogi RP and Mehrotra BN: Compendium of Indian Medicinal Plants, Publications and information Directorate, New Delhi, First Edition 1993: 385. Rastogi RP and Mehrotra BN: Compendium of Indian Medicinal Plants, Publications and information Directorate, New Delhi First Edition 1995: 427. Ahmadian S and Fakhree MAA: Henna (Lawsonia inermis) might be used to prevent mycotic infection. Medical Hypotheses 2009; 3: 629-630. Sharma A, Rathore M, Sharma N, Kumari J and Sharma K: Phytochemical evaluation of Eucalyptus citriodora Hook, and Lawsonia inermis Biosciences Bio-technology Research Asia 2009; 6(2): 639-645. Zumrutdal E and Ozaslan M: A miracle plant for the herbal pharmacy: Henna (Lawsonia inermis). 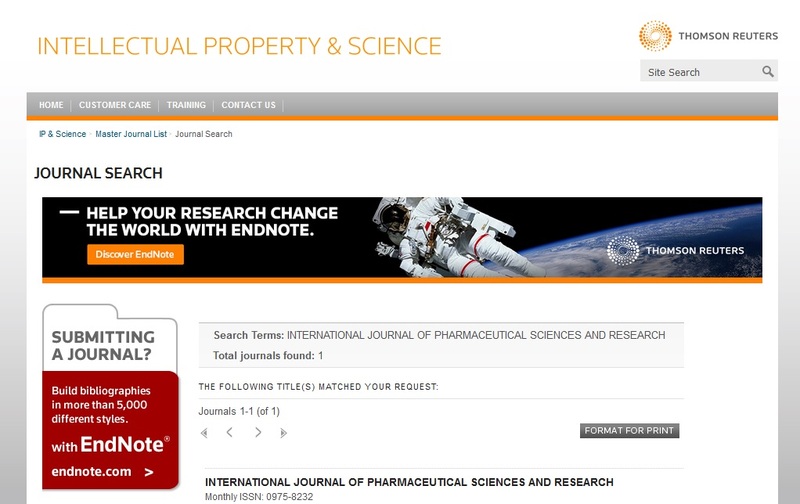 International Journal of Pharmacology 2012; 8: 483-489. Li Q, Gao WQ and Zhao YQ: Advances in studies on chemical constituents and biological activities of Lawsonia inermis. China Journal of Chinese Materia Medica 2013; 38: 795-799. SCCP (Scientific Committee on Consumer Products). Opinion on Lawsonia inermis (henna). COLIPA No.C169, a 6th plenary meeting of European Commission Health and Consumer Protection. Brussels, Belgium 2005. SCCS (Scientific Committee on Consumer Safety). Opinion on Lawsonia inermis (henna). European Commission (EU) 2013. Su JC, Hyun JP, Shin TO, Jun YL and Baik KC: A case of allergic contact dermatitis due to henna tattooing. Korean Journal of Dermatology 2005; 43: 371-374. Jovanovic DL and Jovanovic MRS: Allergic contact dermatitis from the temporary henna tattoo. The Journal of Dermatology 2009; 36: 63-65. Mendiratta V: Acquired leucoderma after henna tattoo in an Indian girl. Journal of the European Academy of Dermatology and Venereology 2009; 23: 582-583. Moya AIS, Gatica ME, Almagro DG and Larralde M: Allergic contact dermatitis for temporary “black henna” tattoos. Archivos Argentinosde Pediatria 2010; 108: e96-e99. Lamchahab FZ, Guerrouj B, Benomar S, Ourhroui AM, Senouci K, Hassam B and Benzekri L: Henna symbolic tattoo and real dermatitis. Archivesde Pédiatrie 2011; 18: 653-656. Blair J, Brodell RT & Nedorost ST: Dermatitis associated with henna tattoo Safe alternative to permanent tattoos carries risk. Postgraduate Medicine 2004; 116: 63-65. Eager RP: Atopy to henna tattoos in children. European Journal of Emergency Medicine 2005; 12: 189-190. Kang IJ and Lee MH: Quantification of para-phenylenediamine and heavy metals in the henna Contact Dermatitis 2006; 55: 26-29. 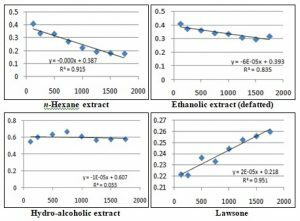 El-Shaer NS, Badr JM, Aboul-Ela MA and Gohar YM: Determination of lawsone in henna powders by high-performance Thin Layer Chromatography. Journal of Separation Science 2007; 30: 3311-3315. Uzuner N, Olmez D, Babayigit A and Vayvada O: Contact dermatitis with henna Indian Pediatrics 2009; 46: 423-424. Calogiuri G, Foti C, Bonamonte D, Nettis E, Muratore L and Angelini G: Allergic reactions to henna-based tem-porary tattoos & their components. Immunopharmacology & Immunotoxicology 2010; 32: 700-704. Turan H, Okur M, Kaya E, Gun E and Aliagaoglu C: Allergic contact dermatitis to para-phenylenediamine in a tattoo: a case report. Cutaneous and Ocular Toxicology 2013; 32: 185-187. Kokate CK: Practical Pharmacognosy. Vallabh Prakashan, Edition 4th, Reprint 13th, 2009: 146-147. Ostling O and Johanson KJ: Microelectrophoretic study of radiation-induced DNA damages in individual mammalian cells. Biochem Biophys Res Comm 1984; 123(1): 291-8. McKelvey-Martin VJ: The single cell gel electrophoresis assay (comet assay): A European review. Mutat Res 1993. 288(1): 47-63. Fairbairn DW, Olive PL and O'Neill KL: The comet assay: a comprehensive review. Mutat Res 1995; 339(1): 37-59. Nadin SB, Vargas-Roig LM and Ciocca DR: A silver staining method for single-cell gel assay. J Histochem Cytochem 2001; 49(9): 1183-6. Choucroun P: Comet assay and early apoptosis. Mutat Res 2001; 478(1-2): 89-96. Mungle AN, Ittadwar AM and Begde DN: Natural alternatives to treat cancer: A study on anticancer activity of Lawsonia inermis Linn. Int J Pharm Sci & Res 2019; 10(2): 869-74. doi: 10.13040/IJPSR.0975-8232.10(2).869-74.